I choose to take that alleged insult as a compliment, thank you very much. Today's post is really about utilizing complementary stitches in shared spaces. My case study is a dress on an ice skater. The shared space is the dress and I used two different square stitches for the bodice and the skirt. I made that choice because of the tiny waist, blouse, and arms. I also wanted something to stand out. Once I landed on a standout stitch for the skirt, I selected a similar stitch on a smaller scale for the blouse. The blouse is stitched in a simple Mosaic stitch and the skirt is a fun 5X5 layered square. The stitched sample used Neon Rays on 13-mesh. What I like about Neon Rays for this application is how smooth and flat it is. It lays perfectly (with a little help from a laying tool). If you want a more pronounced lift with a metallic thread, use a more defined and substantial thread such as Kreinik Metallic (size 8 on 18-mesh and size 12 on 13-mesh). For a flatter matte finish, use a stranded floss (silk or cotton) with a laying tool. If you like what you see on this blog, want to learn some very creative decorative stitches, and how to put them all together, whimsicalstitch.com sells stitch guides for Melissa Shirley Designs and Zecca Designs. 28 guides are currently available and more are in the pipeline. Sign up with your email address to receive weekly blog posts and occasional updates. 3X3 squares can be frustrating because they are just on the cusp of being something significant. If you could just do one or two more rows, there are lots of fun options. Alas, you are so wrong! (Okay, I'm wrong, but work with me on this.) Since it is still a small space (and this is #smallspacesunday) don't forget that combining threads (whether color or finish) is always a great start. Here are four straightforward 3X3 stitches. The first is the classic Scotch square. The remaining three all have a little extra something due to the addition of a second thread. As I was playing with 3X3 stitches for this post, I wanted to add a tied stitch, but realized I covered that in the 4X4 post with the Tied 4X4 Square. (You could also "tie" 3X3 Alternating Scotch Squares.) I started to play with this idea and ended up with what I call Whimsy Squares. This is a version of a Rice Stitch with the top stitches going over two rows instead of one. (If there is a formal name for this stitch, I would love to hear it! I could not find a name anywhere.) The gray lines are added first, followed by the yellow or aqua lines. Play with thread choices and have fun! The sequence of the yellow and aqua lines can be tricky. The sequence is numbers followed by letters. The only step to be mindful of is the last step of the diamond on the top. Take a look at the "g-h" step. You slide the final thread ("g-h") under the pre-existing thread ("a-b") to complete the stitch. I consider the next stitch the classic 3X3 square, the Rhodes stitch. The Rhodes Stitch is an elegant, clean stitch. It's great for borders or corners as its height gives it some stature. It also makes a fantastic Christmas ornament or button, as it is a scalable stitch. It is also adjustable to the space, whether it be a larger square or even a rectangle, as illustrated by the stitched sample on Instagram. It is the same concept. Starting in a corner, go to opposite corner, and continue to rotate around shape until it is full. The last stitch for today is a stitch I call a Layered Diamond. This is a beautiful accent, whether in a larger space, a border, or even as individual accent. I call it a Layered Diamond because the sequence of the four stitches creating the central diamond are all layered above and beneath each other. The sequence for the diamond is the same as the sequence for the diamond in the Whimsy Square. You insert it under the previously stitched thread, as illustrated in the "Whimsy Square Sequence" diagram above. These stitch diagrams, along with other #whimsicalwednesday and #smallspacesunday stitch diagrams, can also be found on www.pinterest.com/whimsicalstitch/whimsicalwednesday. If you like what you see on this blog, want to learn some very creative decorative stitches, and how to put them all together, whimsicalstitch.com sells stitch guides for seasonal Melissa Shirley designs. 20 guides are currently available and more are in the pipeline. The true inspiration for a month of squares is this stitch from Carol H. Lake's "Desert Island Stitches." I discovered this stitch last Fall while working on a club series and was absolutely charmed. It was the perfect proportion for the space, I could add contrasting color, and it was such a unique interpretation of a square. The stitched sample on Instagram uses contrasting colors. I also used it on the body of a boat (with a solid color and a white accent for the cross stitch). I love both as they play the stitch completely differently. The stitch sequence is numbers, followed by small letters, followed by capital letters. The only step to be mindful of is the last step of the diamond (small letters). Take a look at the "g-h" step. You slide the final thread ("g-h") under the pre-existing thread ("a-b") to complete the stitch. Expanding this into a pattern illustrates what a pretty stitch it is. It's perfect for a floor, tablecloth, or clothing. The single stitches in the corner are optional as you may want more of the underlying X to be exposed for whatever effect you seek. Another idea for the intersection where the yellow stitches are is to add an upright cross over two rows in each direction. The combination of thread weights and finishes is important for this stitch. You need a balance of lightweight and heavy threads, with an emphasis on lightweight. An example for 13-mesh canvas is a heavier thread, such as Rainbow Galleries Very Velvet, for the X, and follow with a lighter weight metallic such as Kreinik Metallics Fine Braid (#8) for the aqua diamond and a stranded silk or floss in a contrasting color for the yellow corners. The last 5X5 idea for you today is the Covered Scotch. This is another scalable stitch and is a great way to add color and texture to a space. This stitch works equally well with threads with similar color values or contrasting colors. My favorite combination is a flat metallic thread (such as Neon Rays, Fyre Werks, or Shimmer Ribbon) for the bottom thread and Very Velvet for the corners, with both threads in similar color values. The eye gravitates towards the corners, so put the finish or color you want the attention to go to in the corner. A very happy New Year to you and yours! I'm trying something a little different for you this month. #whimsicalwednesdays and #smallspacesunday posts for January will focus on variations of a common stitch, specifically square stitches. The collection of diagrams for this month were curated from my personal favorite stitches, stitched pieces that inspire me (from my circle of needlepoint friends), and my go-to books. Each post focuses on a specific size square and includes a small sampling of the stitch possibilities for that size square. These are just thought starters and I hope they help you create something magical! The month begins with 4X4 squares. A simple and elegant way to dress up 4X4's is to alternate the directions of the squares AND add contrasting threads, in the opposite direction, on top of the square. The stitched sample on Instagram illustrates a tone on tone with a bright accent with similarly weighted threads. However, don't let that or the width of the gray line in the diagram restrict you. This is a great stitch when you add a light thread across the top. Think Vineyard Silk on 13-mesh with an overlay of Kreinik Metallics Fine Braid #8. By alternating the squares and setting the corner stitches apart with a contrasting thread (color or finish), you begin to see whole new patterns that don't even look like squares, but are squares. I call it the Corner Stitch because the eye is drawn to the unique corners. You can take this one step further and add open space and more pronounced accents. This version removes the single stitch corners, creating two open spaces. One is shaped like a square and one is shaped like a triangle. You can fill one or both with the same or contrasting stitches. Personally, I like to fill only one as it creates a smoother design pattern, but it is a matter of personal taste and what the space requires. Alternate filling stitches include Plain Needlepoint, Smyrna Cross, Beads, or French Knots (select list). Mix and match to your heart's delight. The next diagram splits the widest stitch in half. This is a personal favorite as I like the subtle texture it adds. It is a technique that works better with lighter colored threads, so the split stitch is more clearly visible. The next diagram provides an open alternative. It is an exact square but looks much softer than other square alternatives. The above diagram is scalable as well and works especially well with even numbered squares, allowing the gray Upright Cross to be in the exact center of the stitch. The last two diagrams are related. I call them "Forgetful" Squares. By "forgetting" to add the single stitch in each corner, a world of possibilities opens up. When you start expanding the color palette, as you do in the larger version of Forgetful Squares, it can be downright clever and beautiful. The color inspiration for the pattern in the larger diagram is drawn from the stitched photo in the lower right hand corner of this collage on flickr. I absolutely love the colors in the sample. 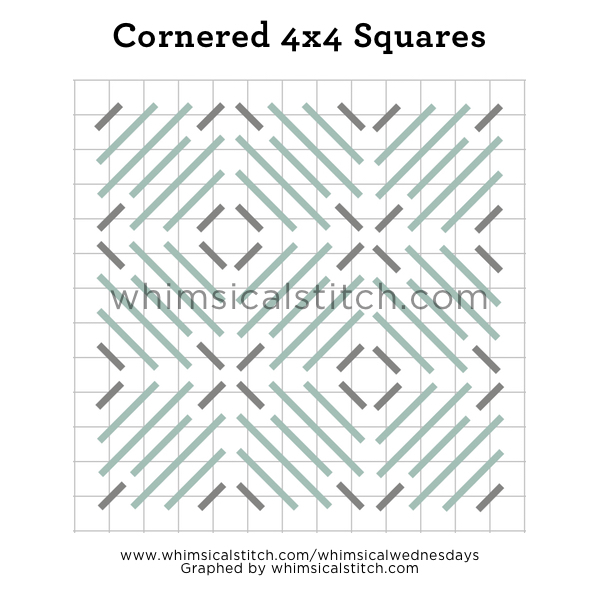 I hope these diagrams prompt a lot of creative ideas for your next square stitch!